Bees of all types have a somewhat fearsome reputation, but they are generally peaceful and very beneficial. There are about 25,000 species of bees along with the most recognized honeybee, according to the University of California. Many garden plants and trees owe their reproductive abilities to the busy work of the bee, and the produce from that labor lines supermarket shelves in jars of golden honey. Clover and dandelions might make gardeners frown, but not a bee. Easy to grow and pretty to look at, a field of clover is a sure-fire attraction for bees. Clover honey is the most commonly found honey on the commercial market. Even though the season for dandelions is short, bees make good use of the delicious pollen collected and produce great honey with it. Bees love herbs and make honey from thyme, sage, basil, and chamomile that is not only tastes good but has medicinal qualities. Herbs make a great garden addition for their many cooking attributes, ease of growth and beauty. 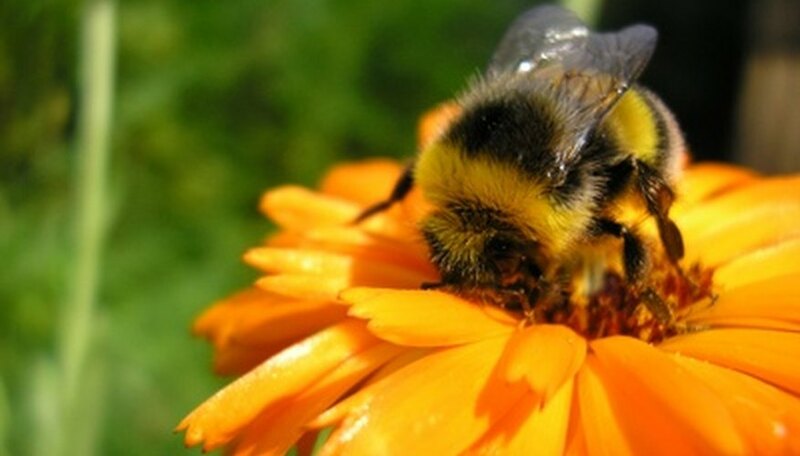 Bees come in to get their pollen, and the rest of the garden benefits from their presence, since many vegetables must be externally pollinated. The bustle of the bees in the garden does the job while they get what they need. Bees love flowers. Sunflower, barberry, geranium, cornflower, and broom are some of the most popular and attractive to bees. Roses are a special favorite of all types of bees. Honeybees make great use of rose pollen and create delicious honey. Another favorite is catnip. This exciting plant isn't just for cats--bees love it, too. It is a large, 2- to 3-foot plant with big, bold flowers that bees find as irresistible as cats do. Fruit-producing trees also have delicate flowers that produce pollen to create the fruit. Bees love fruit trees, which need bees to spread their pollen. Plant apple, cherry, orange, peach, plum or apricot trees to attract bees. Don’t forget the luscious berry bushes; bees are attracted to blueberry, raspberry and even strawberry.